The 2 founders of Gate City Brewing Company come from other US states, but in the last decade have landed themselves as proud long-term Georgia residents. Naming the brewery after Atlanta’s well known label (gate city of the new south), they focus on accentuating everything “Georgia.” From the phoenix on their logo, to beer names like Terminus Porter and “1864,” there’s no doubt from out-of-towners as to where this brewery can be found. Gate City Brewing is located in the heart of Roswell’s historic district in metro Atlanta. Surrounded by a vibrant region of new restaurants and bars, they have strategically placed themselves where no one will be able to miss them. If their giant logo doesn’t bring you in the front doors, then the excited crowds, live music, and food trucks might! While this big warehouse in the downtown area might struggle with the air conditioning this summer, they at least have a strong selection of highly drinkable and flavorful beer to help keep you cool. 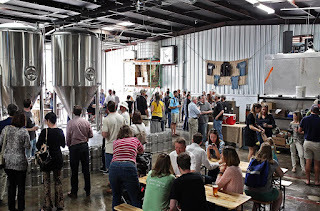 Several chairs, picnic tables, and a giant fan help to make you comfortable as you sip beer after delicious beer while listening to local musicians and enjoying the company of others. Best Beer: Terminus Porter - This porter has exploded since hitting the local taps around Georgia. It stands out from other porters with its old world hop flavors and lightly rich malts. It is strong without being heavy, and creates a complex and enjoyable palate. Have you ever found yourself contemplating what to do with your life? Has that ever lead you down 2 different paths? Were those 2 paths to either open a brewery or move to Maine and start a goat farm? Some of those questions may sound familiar, however, the 3rd is probably unique. This is the predicament in which Kathy Davis, founder of Abbey of the Holy Goats Brewery, found herself. I think that you can guess which decision won out. Using an award winning business plan, Kathy started this brewery with her passion of Belgian beers and all that goes into them. The all women brewing team and Kathy, focus on modernizing classic Belgian styles to hone in on the best of those styles and introduce them to the world. In my visit to the brewery, I found classic styles, such as a Belgian golden strong and a Belgian tripel, as well as more modern takes, like their Belgian Double IPA. While I enjoy visiting breweries with large selections to try, it’s a nice change of pace to visit one that focuses on quality rather than quantity. The beer styles are not the only thing in this brewery that offer an abbey-like experience; Walking in the front door, you are immediately transported into the hall of a small monastery itself! In the middle of the room you will find a large central table for all to gather around. 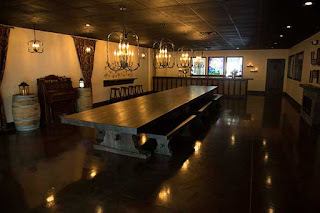 They have several different fun and interesting new games to be played, and a beautiful handmade beer list on the wall. Take the tour and learn more about some of their innovative practices, such as plastic kegs, and find out their most recent plans for expansion like their upcoming bottling line. As you try these enjoyable new beers, you’ll likely find yourself immersed in the makeshift abbey culture; give in to it, commune with your fellow man, and be inspired to appreciate the Beglian styles that have changed the world! Best Beer: The Goat's Obsession - Belgian Double IPA - While not for the faint of heart, this strongly hopped brew remains surprisingly drinkable, well balanced, and smooth. Much darker than your standard IPA, it has a sweet malt backbone that blends well with the floral hops and the bitter aftertaste. While you should probably only have one, my bet is that you order a second.